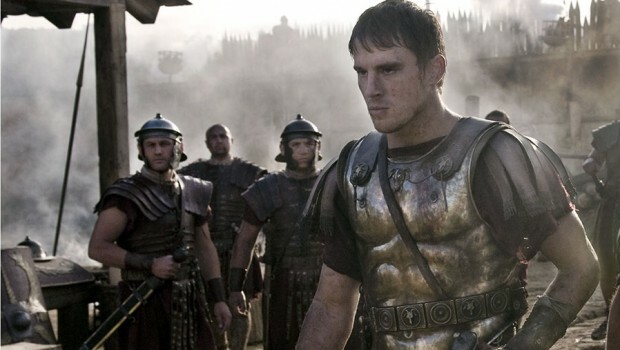 Centurion, starring Michael Fassbender and Dominic West, failed to make waves at the box office; much more is expected of Academy Award winner Macdonald; with the backing of Universal Studios, bankable hottie Channing ‘Step Up’ Tatum in the lead role, adapted by Jeremy ‘Mrs Brown’ Brock from the classic bestseller by Rosemary Sutcliffe, on paper it looks like a winner. But does it deliver? Tatum plays Marcus Flavius Aquila, a centurion delighted by his first posting to Britain, yet terrified that he will let down his men; determined to restore the family honour and redeem his father, a byword through the Empire as the man who lost the Eagle of the Ninth. He bravely leads his men against an attack on their small fort and is commended by Rome; he is also discharged, his injuries deemed too severe. Marcus retires to the villa of his uncle Aquila (Sutherland), where he convalesces and sulks. Attempting to cheer him up, Uncle Aquila takes him to a gladiatorial contest, where Marcus impulsively saves the life of Esca (Bell), a young British slave. Aquila buys him for Marcus, and though Esca, a chieftain’s son, loathes Rome, he vows to serve the man who saved his life and the pair develop a cautious cameraderie. Hearing a rumour that the lost eagle has been seen somewhere in the north of Scotland, Marcus impulsively sets off with Esca to get it back. The Eagle is classic boys’ own adventure stuff; there is barely a woman in the novel and the film has dispensed with any female speaking roles, preferring to concentrate on the bromance of Marcus and Esca. This, in true Mills and Boon form, begins with bristling suspicion, thaws into grudging acceptance and ends with the two willing to die for each other and sharing little jokes. How much you buy into all this rests squarely on the shoulders of the two leads and while Bell is decent, Tatum is fatally wooden. I’m not really sure that he can act at all; he certainly fails to convince as a Roman soldier. Sadly the direction is equally pedestrian; it feels as if Macdonald was hamstrung by the need to bring in a 12A when really the film would be more satisfying if aimed at an adult market. It isn’t that it needs to be gory, necessarily, but it attempts to depict Roman warfare accurately (I was very excited to see Marcus shouting ‘testudo!’ in the early battle scenes) while shying away from showing any blood. Good use is made of Scottish locations, shot by Slumdog Millionaire’s Antony Dod Mantle, which look convincingly bleak and miserable, but the hair and makeup decisions for the Seal People seem somewhat bizarre – with their mohicans and muddy face paint, they sometimes seem to have wandered in from some sort of crusty camp or festival. A disappointment.